Walk or ride on over with your friends, neighbors, and family to enjoy a public open house and learn about the safety enhancements coming soon to 17th Street & Michigan Avenue. Camine o paseé con sus amigos, vecinos y familiares para disfrutar una cita de puertas abiertas para aprender acerca de los mejoramientos de seguridad que vienen pronto a la calle 17 y la avenida Michigan. Come join us for a day of fun and community outreach for Safe Streets for 17th Street. Music, games and Ice Cream! A “pop-up” Bike Lane, free helmets and helmet decorating plus a bike obstacle and safety course by Santa Monica Spoke for the Kids! 17th Street is experiencing an increase in the number of people walking and biking. People are using the street for neighborhood trips as well as to get to and from the Expo Light Rail station at 17th and Colorado. Members of the community have reached out to say they don’t feel comfortable walking or biking at night or during the early morning along 17th Street. The City is working towards adding safety improvements along 17th Street from Pico Boulevard to Wilshire Boulevard and Michigan Avenue from 14th Street to 19th Street to help address the safety concerns. The goal for the project is to address community concerns and help people feel more safe and comfortable to walk or bike. Another goal of the project is to respond to requests to have the street feel more like a neighborhood street and less of a cut-through street. The project proposes to improve the pedestrian lighting, create better crosswalks and make people who bike more visible and better protected. Help us make 17th Street safer and more comfortable for everyone. Please contact Carlos Morales, Senior Transportation Planner for more information, we want to hear from you! Michigan Avenue Neighborhood Greenway Ribbon Cutting! 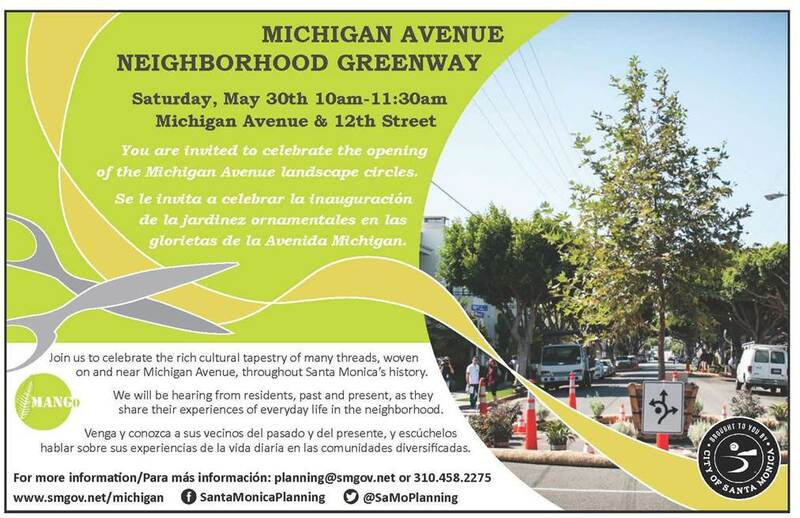 You are invited to celebrate the opening of the Michigan Avenue landscape circles and the first phase of implementing MANGo the areas first Neighborhood Greenway! We join the Pico Neighborhood to celebrate the rich cultural tapestry of many threads, woven on and Michigan Avenue, throughout Santa Monica’s History. Hear from residents, past and present as they share their experiences of everyday life in the neighborhood. SRTS at Samohi and MANGo Passed! Staff recommendations for Safe Routes to School Conceptual Designs passed by unanimous vote this evening by City Council. These improvements will improve all modes of circulation around Samohi and create a safer environment, encourage and prioritize healthy active transportation and help build on the leadership and momentum of the Solar Alliance Students and Bike it! Walk it! MANGo, Santa Monica’s first Neighborhood Greenway passed unanimously this evening! Council set reduced long term goals to 1500 ADT (average daily trips) YEY! Unfortunately, although traffic diverters remain in the ‘TOOL BOX’ – we will need to return to council for “implementation approval” if diverters are needed to reach ADT goals – adding another layer of “vehicle priority” circulation bureaucracy to healthy, safer streets that should prioritize people and SRTS for future generations of children getting to Samohi. PopUP MANGo Summary Infographic displays input from over 400 participants – 73% live in the Pico Neighborhood. The successful PopUP MANGo event collected OPEN and TRANSPARENT input from the community. The results collected at the event by the city and the professional consulting team, (Meléndrez, IBI Group, and Community Arts Resources) don’t line up with what a small vocal group of folks (that don’t wish to drive a few extra blocks) are saying in response community support for traffic reduction by diversion on Michigan Ave. Traffic diversion is only one of several tools that could be implemented on MANGo to reduce traffic. If initial measures implemented such as turn restrictions do not achieve the desired traffic volume reduction goals, diversion could be used to re-route cars just a few blocks off their usual routes but would reduce the more than 4200 cars per day using Michigan Ave between 11th and Lincoln Blvd as a vehicle cut through to the 10 Fwy and as a SAMOHI pickup/drop-off zone. Unfortunately, though we probably can’t expect to reach more typical Greenway traffic volumes of aprox 1000 cars per day we can reduce that current number to a more neighborhood scale. Present and future generations of parents and children need a safer, less traffic congested street that is comfortable for everyone and allows adults and kids to actively transport themselves by walking, skating, running or biking to school and elsewhere. Traffic calming mitigations could correct the unhealthy and inequitable high traffic volumes currently imposed on this residential street as we re-envision a GREAT MANGo neighborhood and community benefit in a healthier, calmer more people friendly street. A street that not only serves people who live in the neighborhood but also enables low stress connections for people walking, biking, skating etc to and from many destinations – from Tongva Park and the beach to Expo line and Bergamot and many locations in between. 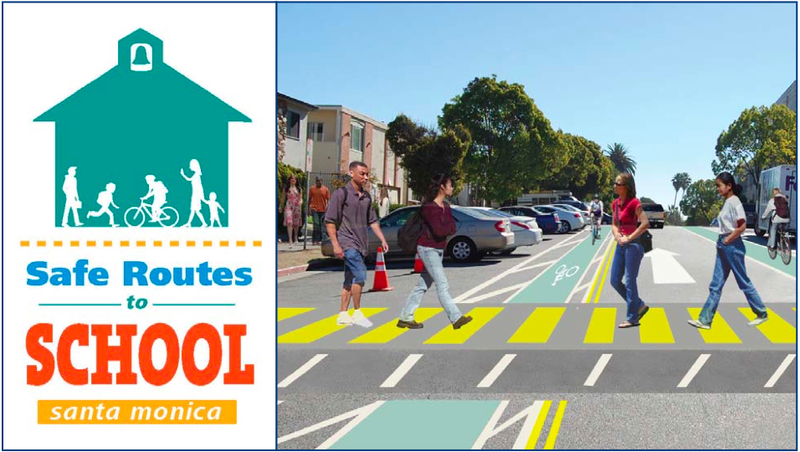 Also worth emphasizing are connections created for “Safe Routes to School” to the many Santa Monica’s schools that are on or near Michigan Ave.
A group within the Pico Neighborhood Association (PNA) launched a campaign against any traffic diversion. They created and conducted their own survey that (though possibly unintentionally) surely led those they polled to reject any sort of traffic diversion by a reported 95% in order to reduce the cut through traffic to a more reasonable neighborhood level. This same survey was administered by another PNA resident who supports the option of traffic diversion and got completely opposite results. Unlike the PNA collected survey, the second group of Pico residents polled overwhelmingly supported diversion as a method to reduce traffic: with diversion at 11th by 86% and diversion at Lincoln by 83%. Each group polled approximately the same number of people. 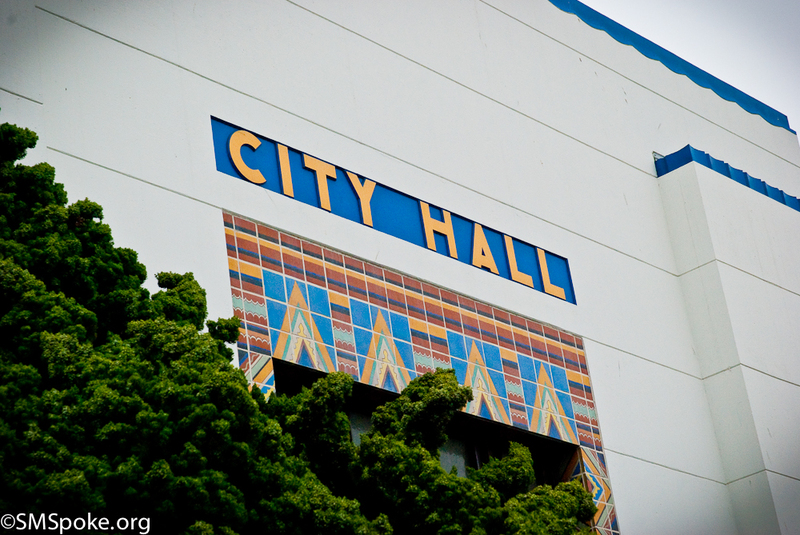 We contend a survey conducted by any partisan group should not supersede the professional non-partisan results collected at PopUP MANGo and the “direct” input given to the city from the community. We support the city’s proposal to use turn restrictions as first step to try and achieve reduced traffic volumes on MANGo. We also believe we must acknowledge the community support to use additional tools, including traffic diversion until we reach measurable successes in desired reduction in traffic volume to goals that will create a healthier, safer, more livable neighborhood and street and the ultimately success of MANGo for current and future generations! You are invited to see a complete review of concepts and designs at this last scheduled MANGo meeting before the project is presented to City Council on February 11, 2014. We believe it is important to get first hand information and provide your own direct input to the project team and help support concepts that will create a GREAT MANGo!